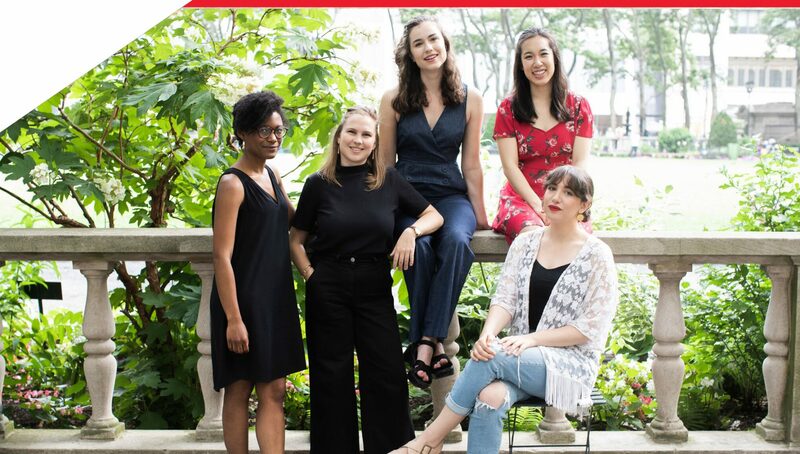 When 18-year-old Audrey Pratt of Needham, Mass., received a ticket to see Hamilton for her birthday, she never dared dream that Lin- Manuel Miranda ’02, Thomas Kail ’99, and members of the all-alumni Hamilton Prize Selection Committee would soon be deliberating over her work, and the work of seven other finalists, in their search for the first-ever recipient of the Wesleyan University Hamilton Prize for Creativity. But on May 17, Pratt discovered that a dream she never dared dream could still come true, when her short story, “Thorns, Black and White,” was announced as the winning submission for the four-year full-tuition scholarship. Pratt has been a writer ever since she can remember. At her home—where she lives with her parents, Betsy and James, her 15-year-old brother, Ian, and her 6-year-old yellow lab, Zoe—you might find her any day of the week working on any number of projects that might someday become novels, stories, or films. Pratt began working on her prize-winning submission—a dark coming-of-age fairytale set deep within a primeval forest—almost two years ago, after seeing a comic about how less than 5 percent of the ocean had actually been explored. “I remember thinking: What if, instead of going deeper and deeper into the ocean, we went deeper and deeper into the forest. What would we find? What if there were human beings who had grown up in this lightless, intense canopy world? What would they be like?” she says. The story was just one of the many pieces in progress Pratt had in her Google Drive folder at the time. And while she considered submitting others—including a romantic horror story and an urban fantasy—she chose “Thorns, Black and White” because its surreal imagery and fantastical storyline were more “out there” than some of her other pieces, with a Brothers Grimm-like feeling that evokes the work of one of her biggest influences: Neil Gaiman. Ask Audrey Pratt to name the best three hours of her life so far, and she’ll tell you: Seeing Hamilton on Broadway. And the single best moment of her life so far? 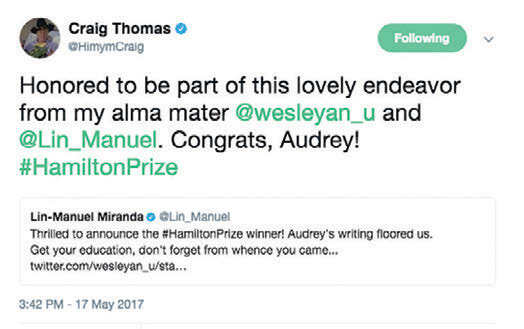 Winning the Hamilton Prize. With a dual interest in cognitive neuroscience and creative writing, Pratt focused her college search on schools that offered established programs in both the sciences and the humanities, because, as she explains, “I didn’t want to have to choose what I wanted to do before I even went to college.” In her junior year at Needham High, Pratt made plans to visit several colleges that had piqued her interest. First on her list: Wesleyan. Realizing that Wesleyan was where she wanted to spend the next four years of her academic life, Pratt applied early decision, submitted her application for the Hamilton Prize, and by mid-May found herself not only accepted as an incoming member of Wesleyan’s Class of 2021 but also short-listed as a finalist for the prize. 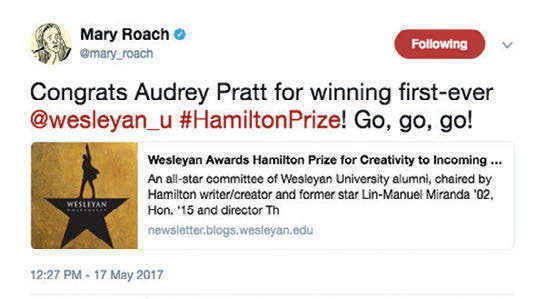 Several months later, Pratt continues to be amazed by the outpouring of goodwill in response to her achievement. “I started a Twitter account about three days before I won, and everyone on the committee was retweeting at me,” says Pratt, shaking her head in disbelief, still. “Tommy Kail called me—I can actually say I played phone tag with Tommy Kail!—and we talked about it. And when I DM’d with Lin, I made a weird reference to one of the Saturday Night Live promos I saw when he was hosting the show, and he was so nice about it. ‘Wow. That was a deep-cut reference,’ he said, in the nicest possible way,” she laughs. 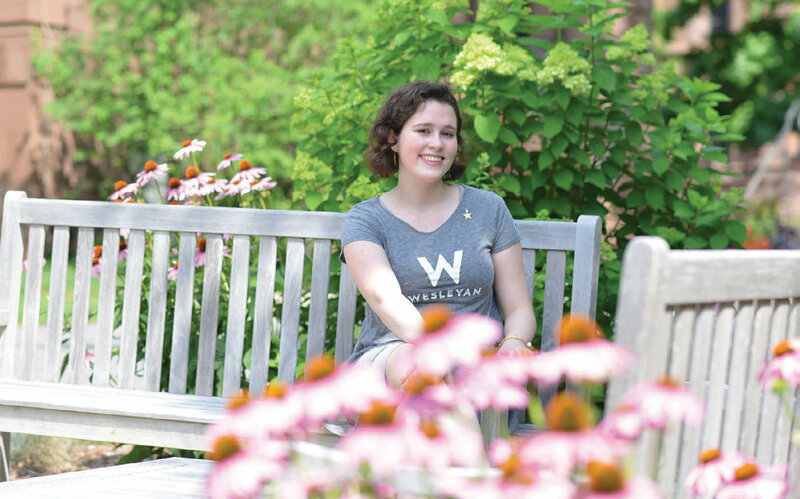 This summer, Pratt is spending her time catching up with friends, visiting with extended family, and preparing for life at Wesleyan, where she intends to double major in creative writing and cognitive neuroscience, and perhaps to explore the Writing Certificate, too. 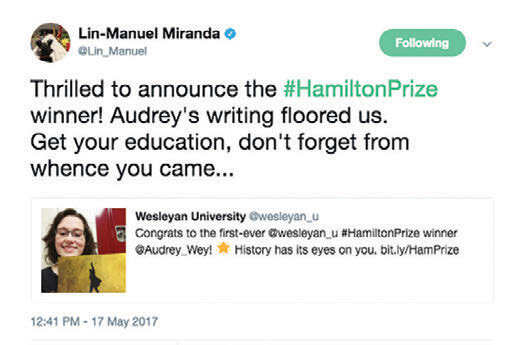 And while she’s fully aware of the expectations that come with winning an honor like the Hamilton Prize, she’s able to deal with the pressure by remembering why she was selected in the first place. 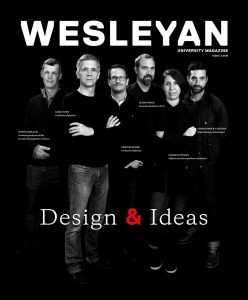 Submissions for next year’s Hamilton Prize are due Jan. 1, 2018, the regular decision deadline for Wesleyan’s Class of 2022. For more information, visit wesleyan.edu/hamiltonprize.